The Walking Ways are six interrelated paths to achieving divinity, or "mantling", of which CHIM is the fifth. [UOL 1] All paths seem to require some understanding of the Wheel, the structure of the Aurbis. According to Vivec, the first to understand the concept was Lorkhan, whose curiosity and desire for change drove him to the rim of the Wheel and beyond, where he looked back at the Aurbis sideways and thereby learned the name of God: I (as a wheel, observed from the side, is an "I"). [UOL 1] Lorkhan then convinced the Aedra to join him in building Mundus, at the hub of the Wheel, in a venture to help others know CHIM and thereby escape all laws which constrained them. [UOL 1] This attempt at CHIM failed, though why it failed has been the subject of intense disagreement and bloodshed from the dawn of creation to the present day. 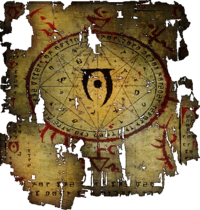 [UOL 1] Some attribute the failure to a mistake, others to Lorkhan's malice; the circumstances are unknown, but Vivec seemed to suspect that the so-called failure only occurred so that others might know how not to fail. [UOL 1] Vivec, who wrote extensively on CHIM, described it as reaching heaven by violence. [UOL 1] He apparently learned of it from Molag Bal. At least one source from the late Second Era thought of Cyrodiil as mostly "endless jungle", yet in TES IV: Oblivion, it is depicted as a land of mostly plains and temperate forests. In that game, Mankar Camoran seems to credit Tiber Septim's use of CHIM with transforming Cyrodiil's climate in order to do away with the jungle. However, Elder Scrolls Online depicts the climate and fauna of Cyrodiil in much the same fashion as the province appeared in Oblivion, yet took place almost three hundred years before Tiber would even be born. Writing in the late Second Era, Phrastus of Elinhir alleged the idea of a climate change in Cyrodiil had arisen in large part thanks to a transcription error, though other scholars of the time who were not ready to write off the whole matter as a myth proposed other theories. "Chim" appears in "Chim-el Adabal", another name for the Red Diamond, which is the centerpiece of the Amulet of Kings. In this context, it presumably connotes royalty, though it might also refer to the splendor of the Red Diamond or the Starlight it might have symbolised to the Ayleids as a soul gem. Judging by its introduction, the text Black Book: Waking Dreams apparently discusses CHIM and related concepts. ^ a b Events of ESO. Vehk's Teachings, The Imperial Library - Excerpts from the works of Vivec and an interview where he helped explain some important concepts. Out-of-game work by former developer Michael Kirkbride.